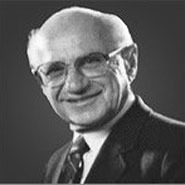 Economist Milton Friedman is best known for his empirical and theoretical research on monetary history and theory, his consumption analysis, and his articulation of a political philosophy that favors minimizing the role of government in favor of the private sector. After receiving his Ph.D. from Columbia University, Friedman spent 30 years at the University of Chicago, where his work challenged Keynesian economic theories and suggested that the Great Depression was caused by the Federal Reserve Board's monetary-supply policies. His views on deregulation informed the policies of governments around the globe, most notably the administrations of Margaret Thatcher in the United Kingdom, Ronald Reagan in the United States, and Augusto Pinochet in Chile. In 1976, Friedman won the Nobel Memorial Prize in Economic Sciences.